Doug Fountain of F.D. 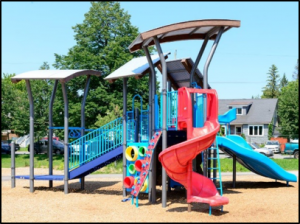 Fountain Landscape Architecture worked with the PlayPower representative Maryanne Swinimer of Playground Planners to create an award-winning park in Optimist Park, Ottawa. Little Tikes Commercial Nu-Edge structures were designed to complement the park’s community center, and the Landscape Architect pulled the site together with pathways, hardscape and plantings. honour, the park will be the Ottawa entry to the 2018 Royal Architectural Institute of Canada’s Urban Design Awards competition! We will be eagerly looking forward to the results of that competition.